The New Year isn't merely about all of that cheesy stuff about "a new you" - it's not even just about resolutions. Yes, that's right - it's also about a fresh new calendar of sporting action and with it, many more opportunities to make money from betting! Here is our brief month-by-month guide to the 2016 sporting events that you simply have to place matched bets on. We may already be approaching the end of January, but there's still plenty to get excited about before the second month of the year, including the Australian Open tennis final in Melbourne, the semi-finals of the football League Cup and the fourth round of the FA Cup. All eyes will be on the start of the rugby union Six Nations tournament on 6th February, as France face off against Italy and Scotland duke it out with England. Come the end of the month is the first big opportunity for silverware for the two remaining teams in the football League Cup, as the final takes place at Wembley. Thrills ahoy this month for fans of both two-wheeled and four-wheeled sport, as the World Track Cycling Championships take place in London from the 2nd to the 6th, while from the 18th to the 20th, Lewis Hamilton, Sebastian Vettel and co will lock horns (or just wheels) at the opening race of the Formula One season in Melbourne. April can only mean quite a number of big opportunities for sports betting enthusiasts - namely The Masters at Augusta, the Grand National at Aintree, the snooker World Championship and, in athletics, the London Marathon. Those matched bets will be generating big returns by this point of the spring! For most observers, this month is all about football. Not only will the Premier League title, European qualification and relegation races finally be settled, but you'll also have the likes of the Europa League, FA Cup and Champions League finals to look forward to. That said, it's also the month of tennis's French Open at Roland Garros and the immensely prestigious Monaco Grand Prix. Don't presume that the football action takes a break in the summer, or at least not this year, as Euro 2016 rolls into town (well, France). But it's also the time of the British Athletics Championships and Olympic Trials in Birmingham, while Wimbledon commences on the 27th, culminating in the 10th July final. France is an epicentre of sporting activity this month, as the Euro 2016 action overlaps with the world famous Tour de France. Cricket fans, meanwhile, will be enthralled by the England v Pakistan first Test at Lord's, and golf aficionados by the US PGA Championship in New Jersey. Don't miss your opportunity to make money online from betting on the Rio de Janeiro Olympic Games, where many travelling Britons will be cheering on our homegrown legends like Jessica Ennis-Hill. Or, if you feel the need for a break from all of that Olympic fever, make a date for the rugby league Challenge Cup final at Wembley or the tennis US Open in New York. Premier League football gets back underway early this month, but for many, the big happenings will be the Rio Paralympic Games from the 7th to the 18th and the Ryder Cup, which tees off in Minnesota in the US on the 30th. 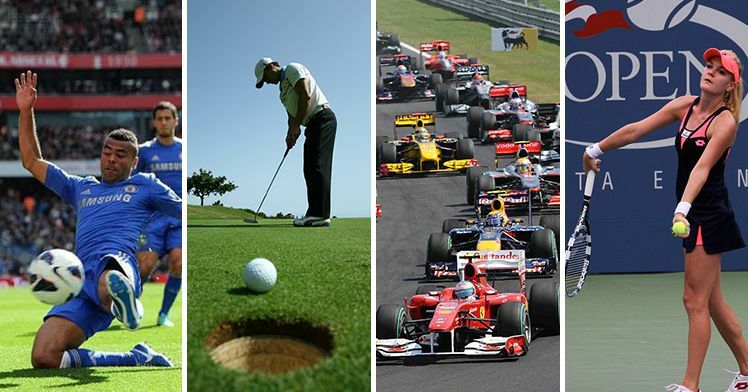 There's continued Formula One, athletics and cricket action, too. A relatively low-key month for sports betting, October nonetheless serves up plenty of opportunities for those with an eagle eye, thanks to such events as rugby league's Super League Grand Final at Old Trafford, the start of qualifying for the 2018 FIFA World Cup and motorsport events like Wales Rally GB, which starts on the 28th and concludes on the 30th. Tennis fans will certainly be placing a lot of matched bets in the penultimate month of the year, as both the ATP World Tour Finals and Davis Cup Final are held. Between the 25th and the 27th, the concluding race of the Formula One season - the Abu Dhabi Grand Prix at Yas Marina - also takes place. Will it be Hamilton, Vettel or perhaps Nico Rosberg at the front of the field? You may think that December is all about sipping the Christmas sherry and unwrapping presents, but there's a fair bit of sporting action to bet on as well. Perhaps you could take a punt on the last matches of the Champions League group stages or - if you are more a follower of horse racing - the King George VI Chase at Kempton? As you can see, there are always excuses to place a few matched bets on top sporting events, whatever the time of year. Sign up to Profit Accumulator today and you could be looking forward to an extremely lucrative 2016, characterised by steady income of between £1,000 and £2,000 each month.